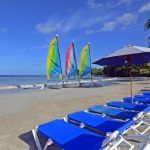 A vibrant, colorful, and refreshingly informal All-Inclusive resort distinguished by its romantic beachfront setting just minutes from the world-class Rodney Bay Marina, Cap Estate Golf Course, and the capitol city of Castries. 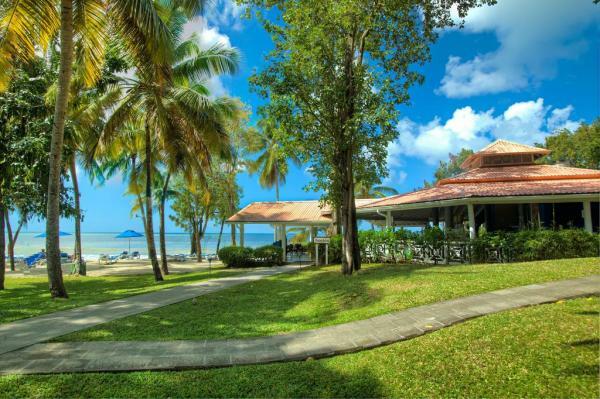 The wide array of accommodations, activities and amenities make St. James’s Club Morgan Bay perfect for couples and families seeking a fun and relaxing tropical getaway. 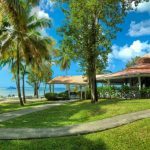 Beachfront resort set amidst 25 acres of beautiful tropical gardens overlooking the Caribbean Sea, minutes from Gros Islet, Rodney Bay, and Castries. 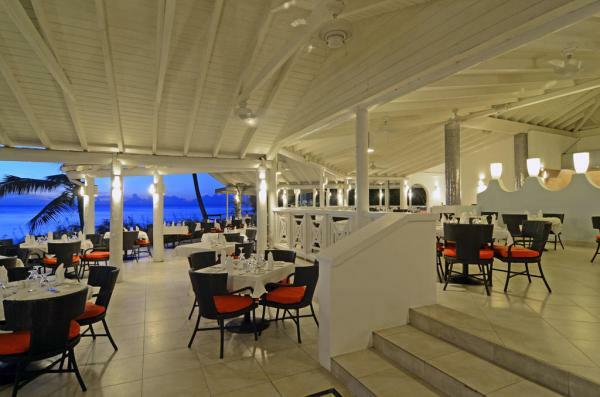 St James’s Morgan Bay has just opened a 5th dining option for dinner – Tree Top Restaurant. 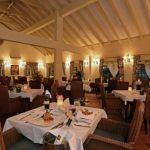 The menu will include pizza, pasta and salads, all cooked to order and service in the outdoor terrace overlooking the Resort. The Restaurant will be open between 6.30 and 9 p.m. each evening. Garden View Rooms. 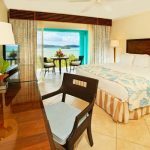 Caribbean-themed rooms with choice of King or 2 Double Beds. 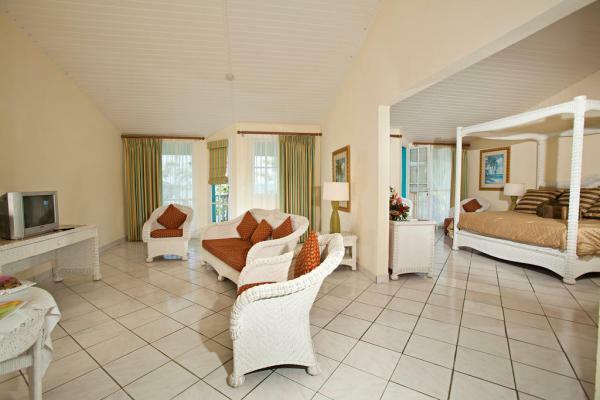 Each room features its own terrace or balcony, with lovely tropical garden and/or pool views. Ocean View Rooms. Bright, breezy rooms with choice of King or 2 Double Beds. 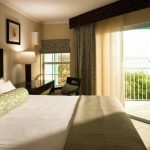 Each room features a terrace or balcony with full or partial ocean views. Beachfront Rooms. 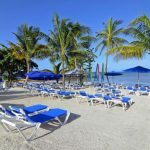 Bright, breezy rooms closest to the beach with choice of King or 2 Double Beds. 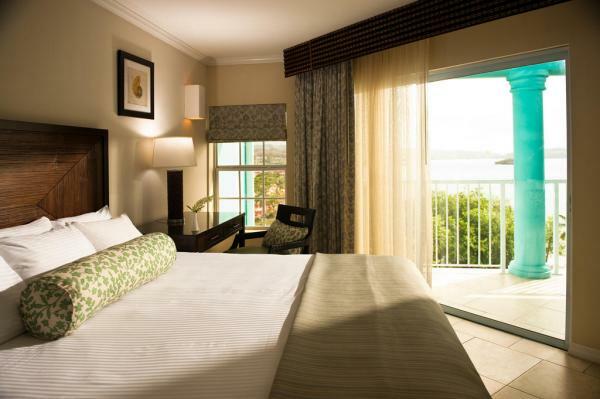 Each room features a terrace or balcony with ocean views. 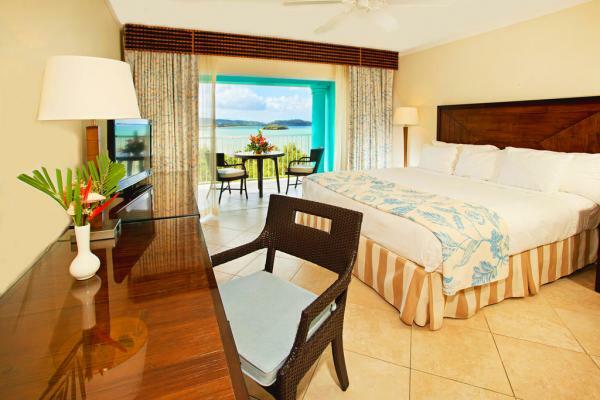 Deluxe Ocean View Rooms. 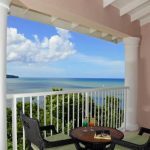 These terrific hillside rooms feature upgraded furniture and decor, with panoramic views of the Caribbean Sea, the resort, and the romantic lights of Castries in the evening. One-Bedroom Ocean View Suite. 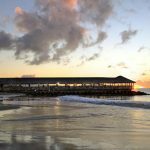 Our very best Ocean Views! These hillside suites offer a spacious bedroom and adjoining living area, and bathrooms featuring large Roman tub / shower combos. 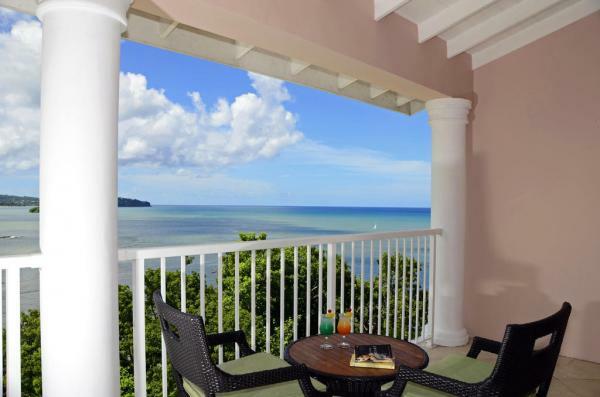 Private terrace or balcony spans the entire width of the suite, with stunning panoramic views of St. Lucia’s west coast, the Caribbean Sea, and the Resort. Family Suites. 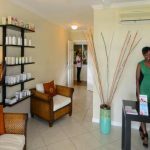 Pairs of Garden View Rooms with interconnecting doors, with a King Bed in one room and 2 Double Beds in the other. Requests should be made in advance. private terrace or balcony, and in-room safe. Free wireless internet in lobby and Sunset Lounge area. All rooms are Non-Smoking. Smoking is permitted on outdoor terraces and balconies. No pets allowed. 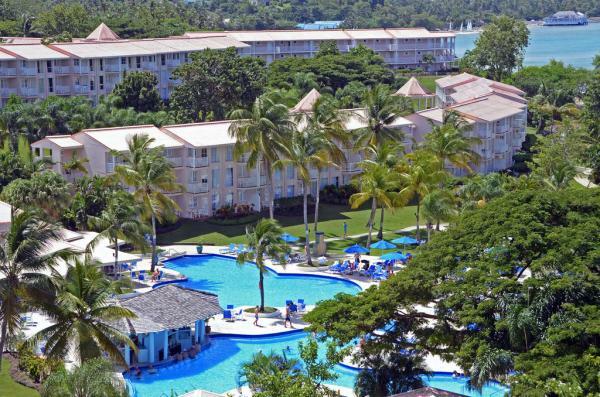 The resort features five distinct restaurants offering delightful buffets and attentive à la carte service. 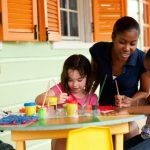 Service hours and number of restaurants open per day may vary seasonally. 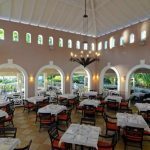 The Palms Restaurant offers classical Caribbean architecture in a lush garden setting, featuring both buffet and à la carte options. Full bar service. Casual attire. 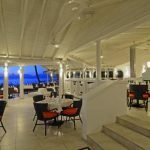 Bambou Restaurant is an al fresco beachfront restaurant with modern Caribbean flare and ocean views. It offers a wide variety of grills, seafood, and local favorites. Full bar service. Casual attire. 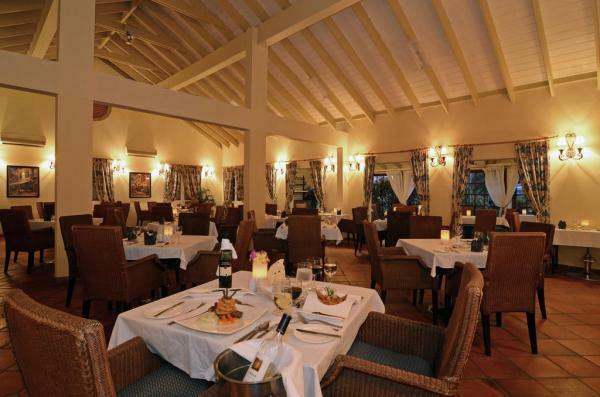 Le Jardin Restaurant offers upscale dining in a romantic fully air-conditioned indoor setting. Lobster, steak, fine wines, and other culinary delights await. Full bar service. 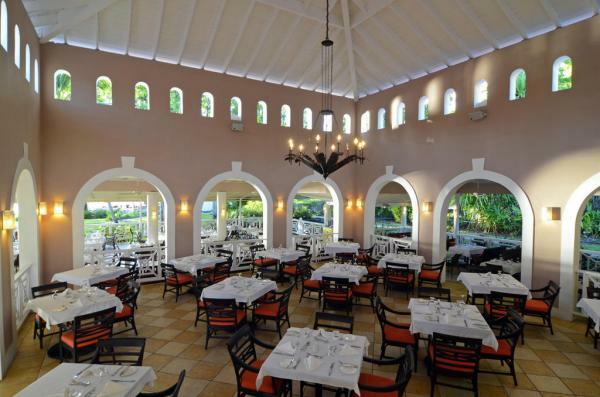 There is a $25 per person surcharge for dining at Le Jardin. Reservations Required. Casually elegant attire. 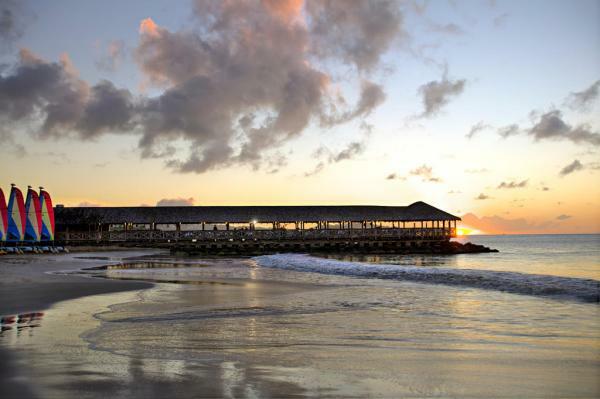 Morgan’s Pier offers an array of seafood and grilled fare on our private, romantic covered pier overlooking the Caribbean Sea. Full bar service. Casual attire. The Choc Bay Cafe serves delicious barista style coffees and cakes as part of the all-inclusive package. Two connecting free-form swimming pools near beach with swim-up bar. Family/Children’s pool area with pool slides and shallow wading areas. Secluded hilltop pool with bar area and panoramic views. Four tennis courts, 2 floodlit. Beach area with sun-loungers and park-like setting. Air-conditioned fitness centre with strength-building and cardio equipment. 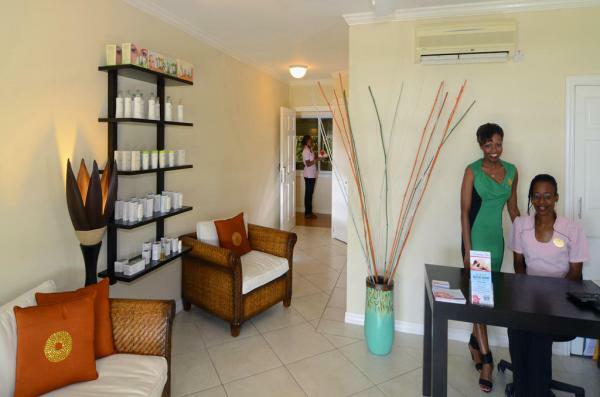 Daily scheduled activities, and live entertainment most evenings. 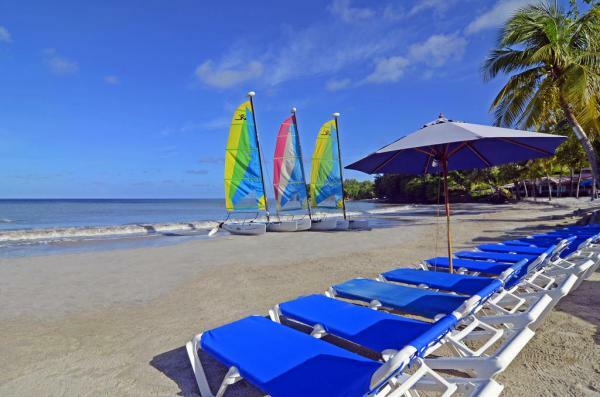 Snorkeling equipment and non-motorized water sports including Hobie Cat sailing, kayaks, and pedal boats. 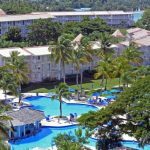 Morgan Bay Beach Resort is an All-Inclusive resort. 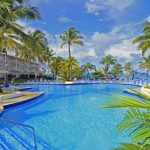 All bookings include accommodations, all meals (breakfast, lunch, dinner), snacks, alcoholic and non-alcoholic beverages by the glass, use of swimming pools, fitness centre, tennis courts, snorkeling equipment and water sports, Kids’ Club activities, and all tips, taxes, and service charges. Bottled beverages (bottled water, etc. ), room service, and off-site tours and excursions not included. There is a nominal surcharge of US$25 per person for dining at Le Jardin Restaurant. Have never had any issues with this company. 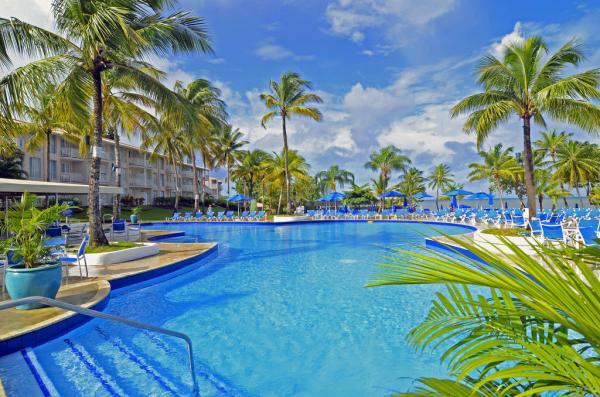 A nice family hotel with good nightly entertainment and the pool and beach facilities were excellent. Helpful staff. Nothing is too much for them. Hotel and Staff were superb - we really enjoyed our stay there. Superb hotel would recommend. Very friendly staff. Been there several times. Always have a good time. Staff very friendly and helpful. No complaints. I did have a problem with the door lock on day 2. It had to be replaced but was fixed promptly and with a smile. 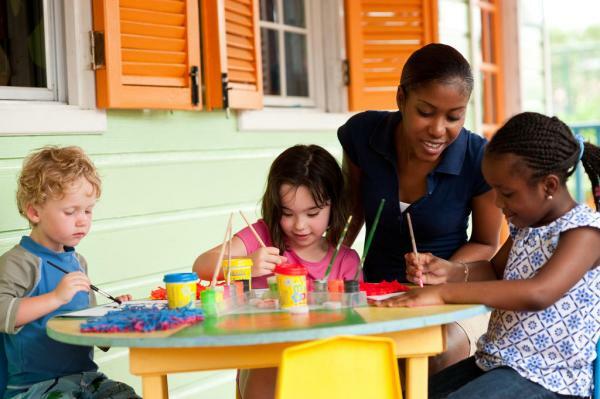 A great family friendly resort with happy friendly staff..cant wait to return.